Touching the Void tells a story so gripping that the best thing the documentary filmmakers can do is become invisible and let the story tell itself. Because all three are interviewed, we know they all survived. But they speak ominously about being underprepared and overconfident, and about the tools and traits needed to survive while climbing. If you’ve read the book or heard their story, you already know what an amazing ordeal they went through. If not, you’re in for a nail-biting, edge-of-your-seat treat. I won’t repeat their story here because the movie tells it so much better. The survivors are interviewed on-camera. They are in a studio, in front of a neutral background. Cinematographer Mike Eley stays close on their faces, as though fascinated by their story. The footage is warm, intimate, and attentive. A tale of mountain survival wouldn’t be much without some footage of mountains. Unfortunately, that calls for re-enactments, which are very problematic. The best a re-enactor can do is underact. (The worst he can do is to overact.) But because the characters are climbers, only occasionally do they require closeups. Even then, subtlety is rarely called-for in this faceoff with the elements. Only once do our narrators call attention to a facial expression and Brendan Mackey, who plays Joe, gives a worthy, believable performance. Acting aside, the climbing footage is outstanding. The high-definition video photography of the peaks, the glaciers, the fields of snow and rock is gorgeous. The footage of people climbing is as tense as any action scene in a thriller. 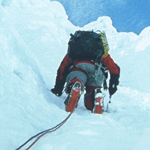 As a moviegoer, I was impressed by authentic feel of Touching the Void. But I’m not a climber, so I can’t attest to it. There were three climbers in my audience, however. Afterwards, they unanimously praised the movie. One noticed that the re-enactors got all the gear, techniques, even the ice bolts and the overhand knots right. Another said this was a movie climbers could look up to, going so far as to say that all the other climbing movies to date are generally looked down on by real climbers. Maybe the fact they saw an advance screening, and for free, exaggerated their praise. But they had nothing bad to say about Touching the Void. My own complaints about the movie are minor, and for many people, probably not worth noting. The music (by Alex Heffes) swells in a couple of places. The emotion of the music is always appropriate for the mood of the scene, but the fact that it swells at dramatic moments is intrusive. Also, toward the end, when one climber goes a little mad, the movie tries a subjective point of view. The handheld camera swirls around. The editing becomes faster and more disorienting. Even the sound design tries to convey “Madness.” Again, the emotion of the presentation matches the emotion of the story, but it is out of pace with the style of the rest of the film, which is more documentary and objective. Finally, Touching the Void suffers same problem as two great documentaries from 2003, Winged Migration and Rivers and Tides. In all three cases, you know that the movie has to end, but the movie doesn’t let you know exactly when. In Void, I began to wonder how many times the survivor could give up hope before we reached the ending. As it turned out, the ending became visible only a couple minutes after I asked that question. So Touching the Void is not perfect. Nevertheless, it is such a gripping, amazing story, and so well told, that movie gets a strong recommendation.